In this illustrated lecture, Professor Michelle Brown, FSA, Professor Emerita at the School of Advanced Study, University of London, Visiting Professor at University College London and Former Curator of Medieval and Illuminated Manuscripts at the British Library, will discuss the introduction of manuscript culture to Anglo-Saxon England and the complex web of peoples, practices and beliefs that lay behind it. The influence of Germanic metalwork (such as the Sutton Hoo finds), Celtic art and thought, ancient Romano-British trading contacts with the Mediterranean and the Middle East all find their place in the pages of books such as the Book of Durrow, the Lindisfarne Gospels, the Codex Amiatinus, the Vespasian Psalter and the Book of Kells to form a new vision of the place of these islands on the world stage. Following the general meeting, Dr Mike Bintley, Lecturer in Early Medieval Literature and Culture at Birkbeck, University of London, gave a stimulating and thought-provoking talk on ‘The Material World of the Old English Andreas‘. The Society attended the once-in-a-lifetime exhibition on Anglo-Saxon history, literature and culture hosted by the British Library and marvelled over the priceless manuscripts and artefacts on display. Prior to the exhibition, the group enjoyed a talk given by a resident expert who contributed to the preparation of the exhibition. 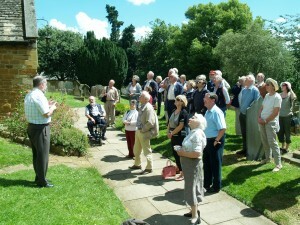 Reports on our trips are to be found in our magazine, Saxon, which can be viewed on this website. and we have travelled as far as Gamla Uppsala, Ireland, Lindisfarne and Canterbury as well as closer to our Suffolk homeland. For more information or enquiries, please contact our SHS Membership Secretary, via the website.